Over the past 18 years we have been producing a variety of hand made gifts, whether it be for an injury or just to keep you warm on those chilly winter nights. Heat Paks are a popular item which come in a variety of colours, shapes and sizes (colours subject to availability). They are made from corduroy and filled with cleaned wheat and dried lavender (non-lavender is available upon request). Poly Cool Bandanas are made from a cotton material filled with organic polymer. When tied around your neck, cooling sensations pass to pulse points and are carried throughout your body to help reduce dehydration and heat stress. Our art smocks come in a range of patterns with sizes varying from 1-XL child. If you wish to make a bulk order, prices can be negotiable. You can find us at the following Craft Markets Australia markets: Mornington/Flemington/Lardner Park/Hanging Rock. We also attend the weekly Mornington Main st market on Wednesdays. We have a large range of embroided hand towels that can be used for many purposes around the house. Australiana gifts for overseas visitors and sporting towels that make great gifts for friends and family. 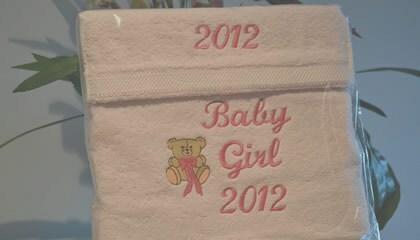 Also available are embroided baby towels - orders can be placed to personalise the towel. Padded ironing board coverscome in 4 different sizes: regular/small/table top and Elna press. They are made from a variety of printed materials and dacron for padding.